ARE YOU READY TO JOIN CUB SCOUTS? Children of different ages have different ranks in Cub Scouting. As you go from Lion Cub to Webelos (Kindergarten to 5th Grade), you learn new things and new skills that you use to meet new challenges as you get older. We are one of a few packs who service our young Scouts in the Brentwood, CA area. Lion Cubs, an exciting new program (starting 2016) for Kindergarteners and their parents. The activities introduce the family to Scouting activities and principles, and at the end of the year they graduate to Tiger. Tiger Cubs. First-graders join a Tiger Cub den, where each boy works with an adult partner on the requirements to earn his Tiger Cub badge. Wolf Cub Scouts. Second-graders graduate into a Wolf den. They go to den meetings on their own, but their families still help them work on the requirements for the Wolf badge. Bear Cub Scouts. Scouts in the third grade are members of a Bear den. They also work with their families to do the requirements for the Bear badge, but Scouts this old have enough knowledge and skill to take on more of the work by themselves. Webelos Scouts. 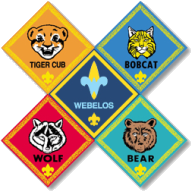 Scouts in the fourth and fifth grades become Webelos Scouts. Webelos Scouts do more advanced activities to get ready to graduate into Boy Scouting. Please click here to sign up or ask questions! Ready to Join? Printable REGISTRATION FORM - bring this with you to the next Pack or Den meeting! Feedback is a gift! Let us know what you think of the new site!